Private: Might the Recess Appointments Clause be the Oddest Clause of All? By Jay Wexler, a law professor at Boston University School of Law. 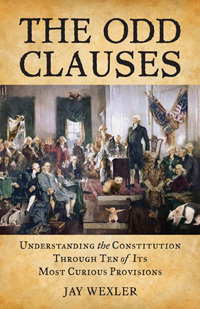 When I first sat down to write The Odd Clauses — my new book about ten of the Constitution’s lesser known but still-pretty-important provisions — probably the hardest question I faced was which clauses to include. This, in turn, forced me to confront the question of what makes an odd clause odd? Are the oddest clauses those that nobody has ever heard of? Those that are historically anachronistic? Those that seem to deal with topics — post roads, perhaps? — that seem somehow beneath the dignity of a constitution? In the end, after many late-night boozy breathless conversations about the meaning of constitutional oddness (not really), I decided that, for me, what makes a clause odd is its specificity. The clauses that I find oddly compelling are those — like the Incompatibility Clause, which prohibits members of Congress from simultaneously holding executive office, or the Letters of Marque Clause, which gives Congress the power to authorize private ships to fight pirates on the government’s behalf —that perform or illustrate key constitutional functions or values (separation of powers, for instance, or allocating power over foreign affairs) in very specific, and therefore (to me, anyway), quirky and odd ways. For the past month or so, speculation ran rampant as to whether President Obama would use his recess appointment power to appoint Richard Cordray as the first head of the newly created Consumer Financial Protection Bureau. Republicans refused to confirm Cordray unless major changes to the law creating the new agency that are unappealing to the President were implemented, and so a recess appointment had been the President’s only option. To stop the President from taking this step, Republican senators decided to hold pro-forma sessions every three days since leaving for the holidays (Democrats, incidentally, did a similar thing at the end of the Bush Administration), relying on past governmental pronouncements that in order to qualify as a “recess,” the Senate must be on break for at least three days. Originally, some speculated that President Obama might appoint Cordray during the imaginary moment on January 3 when the previous session of Congress ended and the new one began, following the example of Teddy Roosevelt, who pulled such a maneuver (to much criticism) back in 1903. Instead, Obama waited until January 4, when he exercised his more typical recess appointment power to install Cordray as the head of the new agency without Senate approval, on the theory that the Republicans’ pro-forma sessions do not render what otherwise would be a recess a recess, for purposes of the Constitution. Republicans are, of course, up in arms, threatening to challenge the President’s exercise of power in court. It is likely that a court — maybe even the Supreme Court — will one day weigh in on whether the President exceeded his power under the Recess Appointments Clause. Do pro-forma meetings count as real Senate sessions? If they do, does the time between two pro-forma sessions (less than three days, in other words) count as a “recess”? These are some hard questions. Legal scholars have already begun discussing them, and they will surely continue to do so as long as the controversy remains live (and probably long after that as well). What becomes apparent as soon as you start thinking about these detailed legal questions is just how far the Recess Appointments Clause has strayed from its original purpose and how difficult that fact makes it to interpret the clause’s meaning. Take the issue of whether a break has to be at least three days to count as a “recess,” for instance. The place to start is the text — does the word “recess” imply any particular minimum amount of time? It’s hard to say. On the one hand, we do sometimes use the word to refer to short periods. My seven-year-old son’s second grade recess lasts but fifteen minutes, and that’s only when nobody kicks a classmate in the line heading out to the playground; more typically, his recesses last about 180 seconds. But on the other hand, the term “recess” does seem to imply something a bit more than a cigarette break. We could, of course, investigate how people understood the word “recess” back in 1787. I don’t think it gets us much further. If the text is inconclusive, then we might next consider the purpose of the clause and try to reach an interpretation that best promotes that purpose. This is where things get really tricky with the Recess Appointments Clause. The original purpose of the clause was to make sure that the President wasn’t stuck with a continuing vacancy for a long period of time while the senators were back in their home states or on vacation or what have you. In the late 18th century and long after that, getting back to D.C. for an emergency session to confirm the President’s choice for secretary of state was not as easy as it is today, when our far flung senators can check their email and head to the airport for a direct flight back to Reagan National. The fact is that the problem that gave rise to the Recess Appointments Clause no longer exists. And so the clause cannot fulfill the purpose for which it was created. And so the purpose cannot help us in interpreting the clause’s meaning. What to do? Maybe we (and the courts) should conclude that it does not actually exist. And yet. Look at the Constitution, and there it is. The clause hasn’t been amended out (maybe it should be, but that raises all sorts of other concerns — the door toward amending the Constitution should be opened with great caution, if at all, lest we find ourselves in willy-nilly amending land), and so it has been used — not just by this President, but by virtually all modern presidents, for an entirely different purpose: to circumvent the Senate when the President believes (and believes that enough of the populace believes) that the legislative body has been unreasonably obdurate in confirming his appointees. This, then, raises the question of whether it is legitimate for courts to interpret the meaning of a clause not by examining the clause’s original purpose, but rather by examining the purpose the clause has come to serve over time. I guess if the answer to this question is “yes,” then any amount of time should count as a “recess,” and the President’s appointment of Cordray should stand. But is the answer “yes”? The hell if I know. The Recess Appointments Clause? An odd clause indeed.